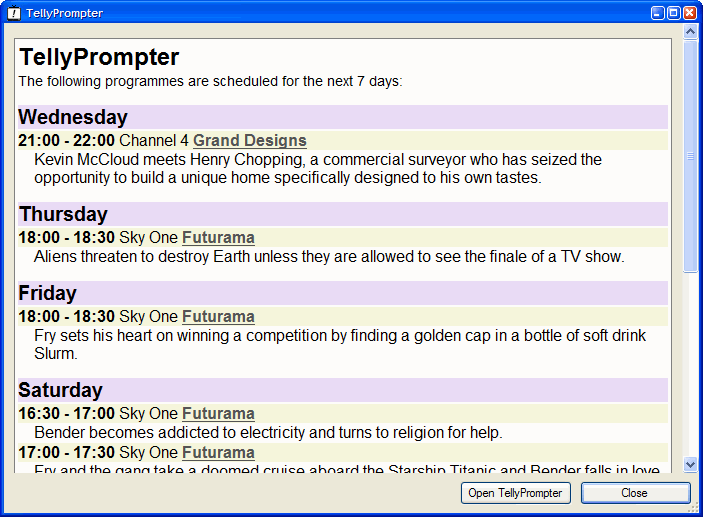 TellyPrompter's main window showing programme listings for the next seven days. 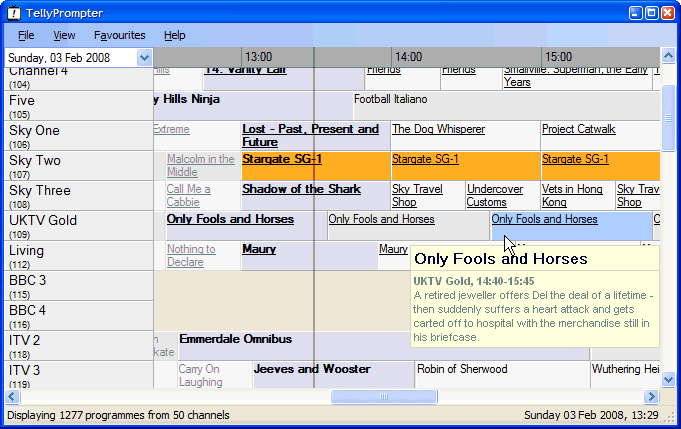 Programme descriptions are displayed at the bottom, and programmes that are flagged as your favourites appear with a different background colour. Simply right-click a programme to add it as a favourite, search for it in the full week's listings, or view more information on the web. TellyPrompter can be configured to display a notification window showing all of your forthcoming favourite programmes each time you log in to Windows. The channel selection window allows you to select which TV provider you use. TellyPrompter displays the appropriate channel numbers, and also lets you find out more about each channel such as by visiting the channel's web site. Individual channels can be selected or deselected to match your personal viewing preferences. 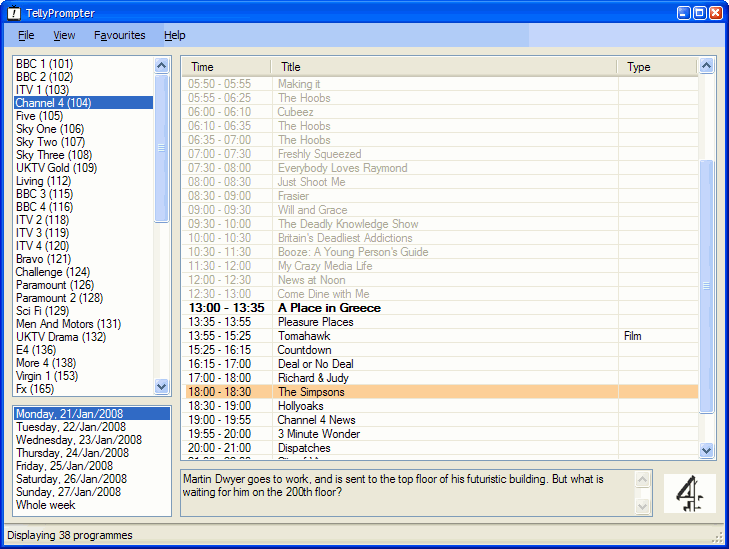 TellyPrompter has a very flexible way of allowing you to specify your favourite programmes. 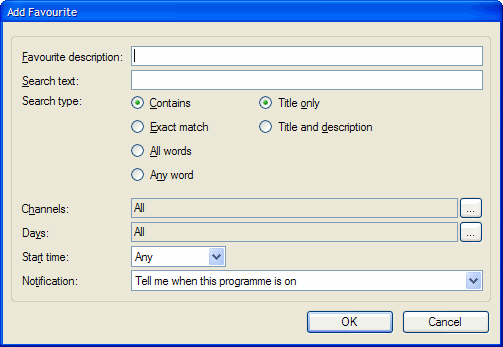 You can provide a simple programme title, or create much more complex searches using patterns of words and searching through the title only or the title and programme description. Favourites can be set to trigger only on certain channels, days or times of the day. You can also configure favourites for programmes that are not currently showing, and TellyPrompter will notify you the next time they are on. You can view all forthcoming favourite programmes directly within the listings window. Want to search the listings for the next week? TellyPrompter allows you to perform complex searches with ease. Search results are displayed directly within the listings window. Searches can be easily promoted to favourites if you decide you want to be notified about your search results in the future.